Here at HYDROSPARES we have tried to provide a comprehensive range of capacitors for the Pool, Spa and bath industry. 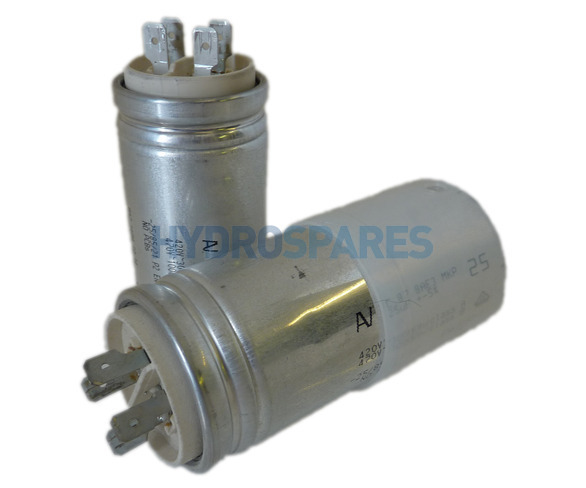 Both lead and terminal type capacitors are available from stock and are usually used for the starting & running of pump motors. Manufactured from materials such as self-healing metallised polypropylene film and self-extinguishing plastic resin material. Due to the variety of capacitors out there, match up your existing capacitor using our specification and description Tabs.Select a capacitior then check the dimensions to ensure a correct fit. A final note the screw on the capacitor is just used if you require to fix the capacitor to anything. Capacitors can hold a residual charge enough to give you a nasty shock !! So even if you have unplugged your device you can still get a shock if the two terminals are shorted by connecting them! Please contact us if you have any questions or need further advise.